Is it too early to comment on the quality this year? We're going to be in Alba and I'm hoping they will be good or plentiful. I had some last week that were surprisingly very good considering how early it is in the season. Thanks, if you're right, you've made my day! Had this 4.7oz beauty this past weekend. This far quality excellent. Don’t have any trips to Alba planned, but luckily Market Hall in Oakland had one left today. They also have black truffles and they’ll throw in truffle eggs too. Sounds good. A friend (Tuscany born and raised, a chef/restaurateur/sommelier/etc., awarded the title of “Cavalieri dell’Ordine della Stella d’Italia” last year) just arrived from Italy bringing a stash of Alba white truffles, with which he will make a pairing menu for me and a few other friends this coming Thursday. The comments above make it difficult to wait. Last time I buy them online. I got the same tasteless, crumbly crap. for nyers eataly doing a sale at $5.90 per gram today only. Had no intention to buy them but they smelled so great I picked up a couple of ounces for scrambled eggs and Krug for Friday and Saturday brunch. I know some folks aren't fans and I haven't called yet to see what they think, but I've had good luck here, urbani running at 35% off through Tuesday. Last edited by b. c@stner on November 23rd, 2018, 7:00 pm, edited 1 time in total. I know some folks aren't fans and I haven't called yet to see what they think, but urbani running at 35% off through Tuesday. Eataly's truffles were supplied by Urbani. Eataly at $5.90 a gram ends up at over $2600 a pound. We got some through an Italian goods purveyor for $2200 in LA. Although she doesn’t eat it, my wife bought some for me. The whites are very tasty, topped-up and rocked simple butter-and-cream spaghetti. Used the black to enhance scrambled eggs for breakfast. Had this two ouncer a few nights back from Sabatinos and it was fantastic! Has anybody tried the truffle creams that Rare wine Co is offering now? I've bought everything that was offered today; pasta, white truffle cream, truffle butter and truffle oil. I've been very satisfied with all. You need to use a lot for the best taste. 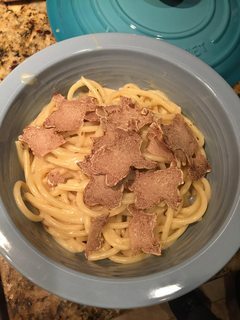 The truffle cream doesn't beak up or evenly spread well on pasta (or maybe there's a technique I don't know), but I love it. It lasts longer than fresh truffles, but not as long as the truffle butter. Thanks Warren, I think I will give them a try. Just returning from 5 days in Piemonte. 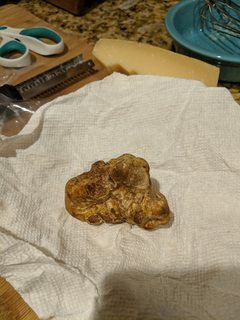 The White Truffles this year were superb - everyone I talked to was ecstatic at both the quality and quantity. The standard price from a truffle Hunter was 2 Euros/gram for smaller ones (40 grams or less) and 3 Euros/gram for the big boys. quality is great this year. We served them at the restaurant this weekend and it was great fun. I was really impressed. I am noticing some relative benefit in restaurants -- anyone else? The experience I've had so far this year has been excellent. Props to the folks at Viaggio in Wayne, NJ for a generous offering at a fair price. Costco has them at $379.99 for 2 oz. Price includes overnight shipping. Damn that's a good deal! I would appreciate pointing in the right direction if anybody finds a deal for an online source, would like to order some for the weekend. I am not familiar with this company but 3 oz. for $350 is a great deal. "This website has been reported as harmful"
Jerry, Is that an available-to-public L.A. source? If so, where? After placing an order the owner contacted me to confirm. He also mentioned that most orders were done by phone or Facebook. The website was not current and white truffles were $80 per oz. Being local he delivered the truffles to my house Saturday afternoon. Very good quality. Urbani end of season 50% off fresh white going on. Just had some black which were good. Also tried the black(summer)truffle burrata and thought it was pretty tasty. Thanks for the tip—order placed. Thanks for the heads up. My orders arrived today and are very good. I bought some for my kids, who will be having truffle parties in LA and NYC this weekend. And for myself, of course. I microplaned 6 grams on some mac ‘n cheese to test them. Very aromatic and delicious.